Pawan Chamling in a bid to strike a joint movement for tribal status to Nepali speaking citizens scattered in the country. Tamang Community enjoys tribal status both in GTA area and Sikkim. terming it as a dangerous ploy of Ghishing that would be detrimental for the local people. Ghishing too had flatly failed to take the local populace into confidence. 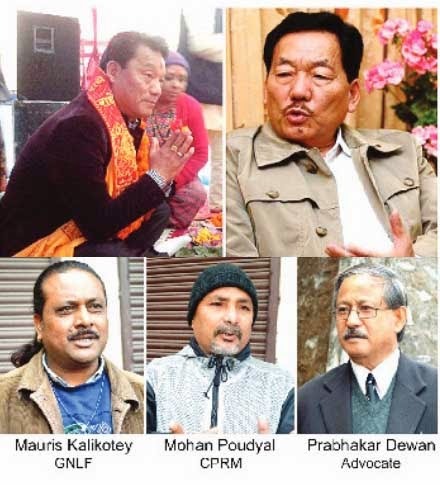 Under such scenario, the demand for the sixth schedule also proved to be one of the reason for Subhash Ghishing and his GNLF party's swan song in the chapter of hills politics. "The demand for sixth schedule is an old stipulation of GNLF and this will forever remain our party's political stance. Referring the party in majority (GJM) Kalikotay said, ‘we always welcome those who want to support us in this matter.’ Adding further, he said that people who failed to understand the importance of sixth schedule then, now shows signs of comprehension and that is appreciated. Advocate, Pravakar Dewan on being asked the legallogic behind the joint movement of tribal status with Sikkim CM said that it should be a political decision wherein if legal criteria followed, the real ground scenario will be investigated to determine whether the people's lifestyle here matches to that of tribals in real sense. ‘Whether Nepali speaking communities fulfills the tribal criteria or not is one part of the story and the rest is a political decision’ said Dewan adding that the ultimate thing that matters in this context is the government's will to give its nod. "If the government re- ciprocates the approach of a small community will also be considered, but if the government is rigid in its decision, the approach of entire country will reach deaf ears,"
pass resolutions but it’s not the case here. But all said and done, a collaborative step is always effective. Meanwhile CPRM secretary Mohan Poudyal opined that Gorkhas fall in the tribal category ‘Gurung’s indication of approaching the Chief Minister of the neighboring state and starting a collective movement might be his (Gu-rung’s) political stunt but if the step is executed responsibly it will be effective; 'Poudyal signed off.